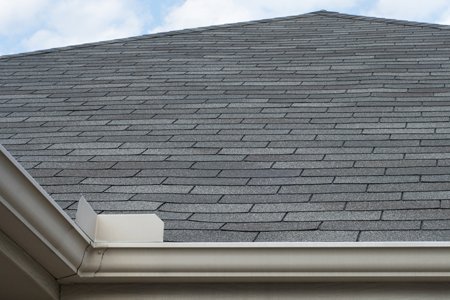 In terms of steep slope roofing, asphalt shingles compose the largest segment of this type of roof system. Asphalt shingles are made out of fibrous glass mats reinforced with asphalt. The asphalt needs to be layered with varying colored mineral granules in order not to be easily damaged by UV exposure. The granules are what give the shingle its finished color. In order to secure the shingles, they are nailed through roof paper or roof overlay of felts (that overlap the shingles) from the roof slope’s bottom to the apex of the roof known as the ridge. To furnish ventilation to the attic space, special ridge vents are often included in the installation. Asphalt shingle roofs offer warranties extending from 10 years to as long as 50 years.